We recently showed that extensive training on a sequence of planar hand trajectories passing through several targets resulted in the co-articulation of movement components and in the formation of new movement elements (primitives) (Sosnik et al. 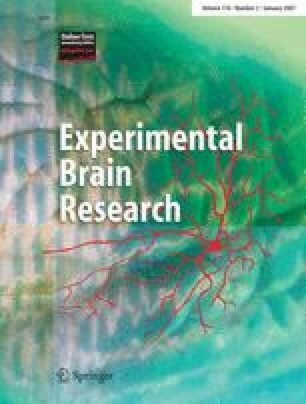 in Exp Brain Res 156(4):422–438, 2004). Reduction in movement duration was accompanied by the gradual replacing of a piecewise combination of rectilinear trajectories with a single, longer curved one, the latter affording the maximization of movement smoothness (“global motion planning”). The results from transfer experiments, conducted by the end of the last training session, have suggested that the participants have acquired movement elements whose attributes were solely dictated by the figural (i.e., geometrical) form of the path, rather than by both path geometry and its time derivatives. Here we show that the acquired movement generation strategy (“global motion planning”) was not specific to the trained configuration or total movement duration. Performance gain (i.e., movement smoothness, defined by the fit of the data to the behavior, predicted by the “global planning” model) transferred to non-trained configurations in which the targets were spatially co-aligned or when participants were instructed to perform the task in a definite amount of time. Surprisingly, stringent accuracy demands, in transfer conditions, resulted not only in an increased movement duration but also in reverting to the straight trajectories (loss of co-articulation), implying that the performance gain was dependent on accuracy constraints. Only 28.5% of the participants (two out of seven) who were trained in the absence of visual feedback from the hand (dark condition) co-articulated by the end of the last training session compared to 75% (six out of eight) who were trained in the light, and none of them has acquired a geometrical motion primitive. Furthermore, six naïve participants who trained in dark condition on large size targets have all co-articulated by the end of the last training session, still, none of them has acquired a geometrical motion primitive. Taken together, our results indicate that the acquisition of a geometrical motion primitive is dependent on the existence of visual feedback from the hand and that the implementation of the smoothness-maximization motion strategy is dependent on spatial accuracy demands. These findings imply that the specific features of the training experience (i.e., temporal or spatial task demands) determine the attributes of an acquired motion planning strategy and primitive. This work was supported in part by the Einhorn-Dominic Foundation, by the DIP grant to Prof Tamar Flash and by the Morros laboratory. Prof. Tamar Flash is an incumbent of Dr. Hymie Morros professorial chair.